After a long, grueling week of classes, assignments and lab obligations, I gave myself the Friday evening off. I had arranged to fish with Daria, my friend from the lab, but she had to cancel due to family obligations. So it was Richard, Tristan and I who spent a few hours down by the lake. A super high pressure system parked over us for a whole week. It had been calm and stable and from experience, the fish really love this kind of weather. When we arrived, salmon were jumping constantly and we were really expecting a good day. As usual, we had to wait until it was dark enough before fish would bite. Right around 7:30pm, I got a bump and it gave us confidence that fish were active. Another few casts later, I felt a little bump and the rod loaded up immediately. A little line came off the reel, but the fish didn't really go on any strong run. I had the drag set tight enough that I don't have to worry about gear failure, yet I can have enough power to pull the fish away from docked boats and dock pilings if necessary. 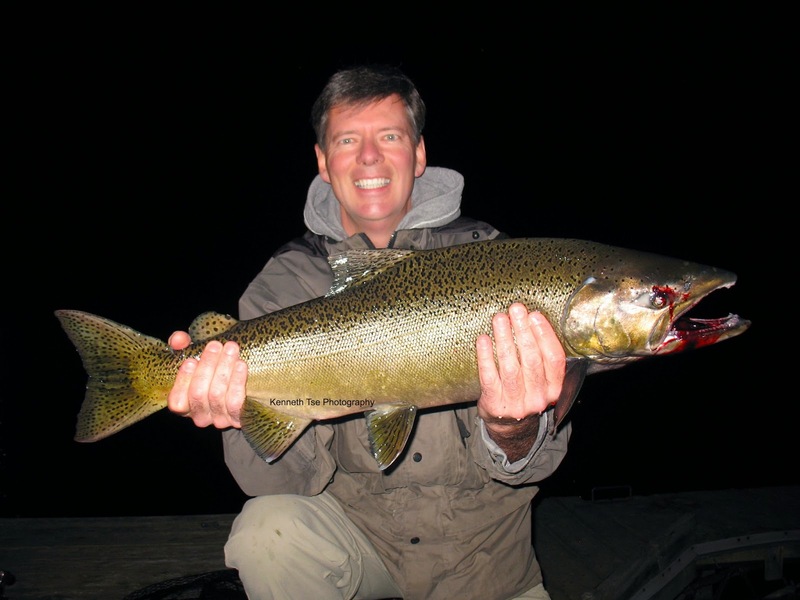 When I used to fish for salmon in the streams, fighting them on light lines (6lb or lighter) would take about 1 minute per pound of fish (ie, a 15lb salmon would require 15min). On the heavier gear now, even with the deeper water and much more room for the fish to run, I can muscle them in within a few minutes. 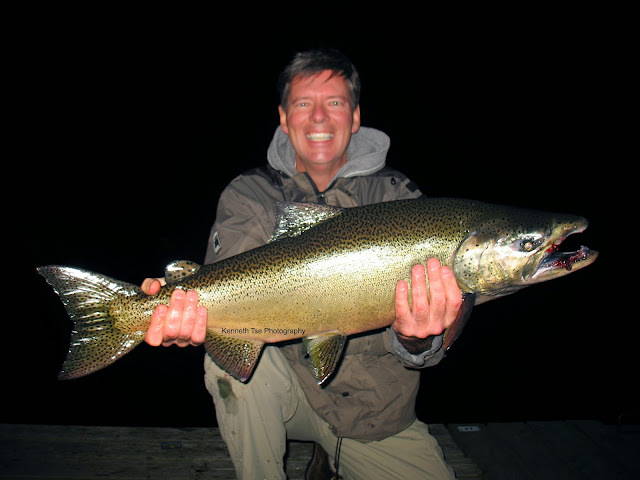 In fact, this 20lb fish felt small during the fight and it didn't even take much of a run on the heavy gear. Richard was tending to his boat earlier and now I got his attention. It was less than 10 minutes before another fish took my spoon again. This time the smaller fish was a bit more spirited and tried to run under a boat twice. But that fish obviously didn't know who was wielding the rod! LOL. Richard's spoon took a good slam but the hook did not set. Strangely, by about 9pm, it went completely quiet. In previous experience, we could continue to pick at fish. However, they simply turned off tonight. This has been my 6th outing for salmon this fall. I've had a hit or two each trip, but really only managed to land fish on the 4th trip and this trip. Hopefully now that these salmon are in the area in better numbers, the stats will be more in our favour in the next week...hopefully two weeks. 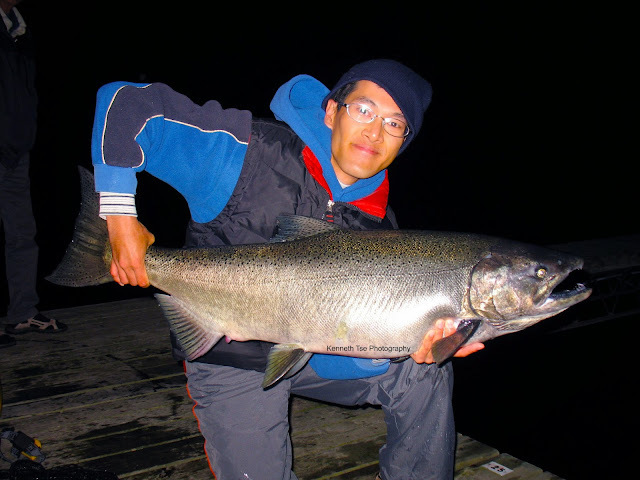 Richard and I had been fishing for some pier salmon since the beginning of September. For 4 straight sessions, we had absolutely zero to show for our efforts, including last night's attempt. We decided to try it again tonight. We are not giving up just yet. There were three of us fishing. Richard, his friend and myself. There were lots of fish surfacing and jumping from later afternoon to sunset. Around dusk, I had a hit but the hooks didn't hit home. About 30 minutes later, Richard's friend hooked one! After a spirited fight, the hook unfortunately pulled out. Bummer! Not too long later, Richard was on. It gave a good account of itself and a little male came to the net. I wasn't going to go home skunked! I was especially happy since I got to test out my Okuma Komodo 364 on a real fish. 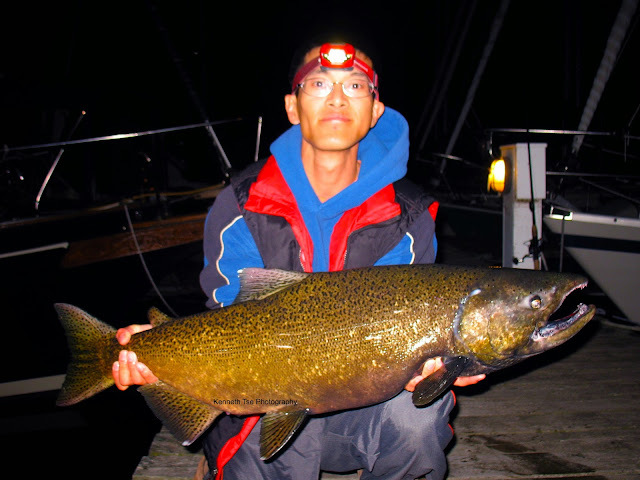 Paired with a 7' MH Shimano Clarus, it was a nice combo for these shore salmon. We fished another 30 minutes more until it was 9:30pm and time to head home. Hopefully this is just the first wave of fish. I would be nice if we can get 2-3 more weeks of this action! 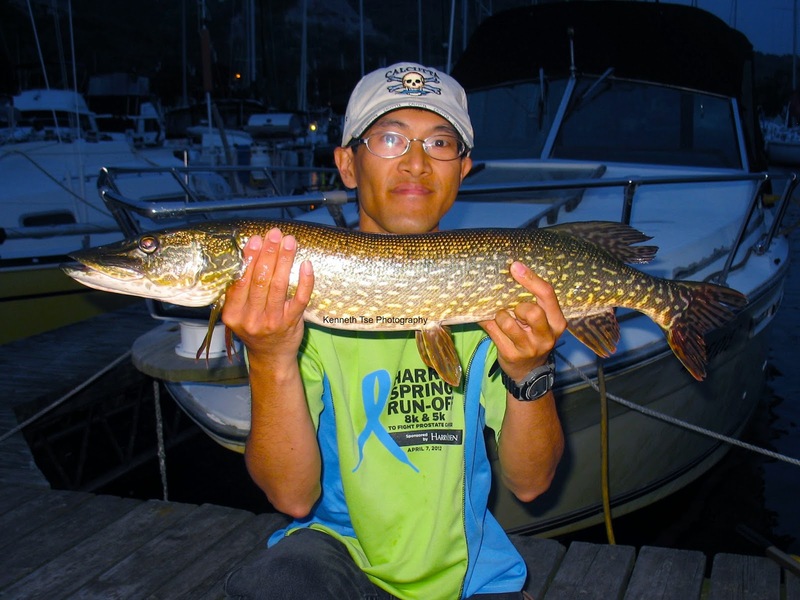 I've been casually throwing lures for Northern Pike since spring, but casual fishing general doesn't produce well. Now that fall approaches, the fish at Richard's marina is getting a bit more hungry. 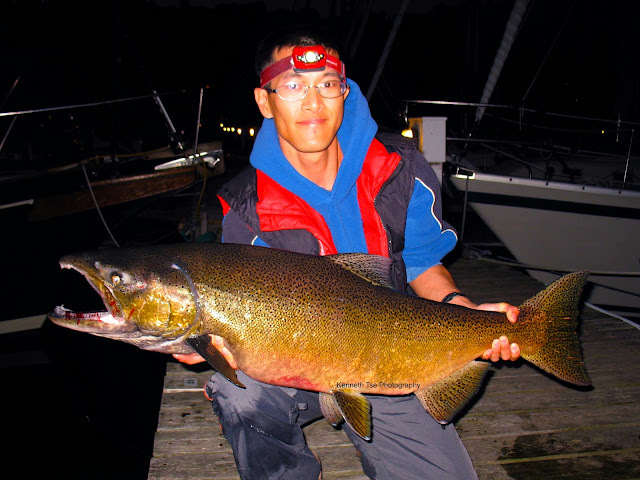 Usually, we'll start fishing an hour before sunset to try a while for pike, and then switch over to Chinook Salmon once it gets a bit darker. There is a particular lure that works well, and a stop-and-go retrieve proved deadly yet again. Unfortunately, a line of thunderstorm chased us off the water before we can work on the salmon. Richard did get a good hit just before the lightning got too close. We decided to hit the clubhouse for a while to wait out the storm...but a few beers later, the storm was still going strong. Instead, we decided to sleep on the boat and give it a try in the morning. The 4am alarm came way too quickly, but we were enthusiastic and chucking glow-in-the-dark spoons in the early morning. It was still drizzling and nothing much was going on. About 5:30am, I finally had a hit and it was another little pike. It got off just as we were netting it. 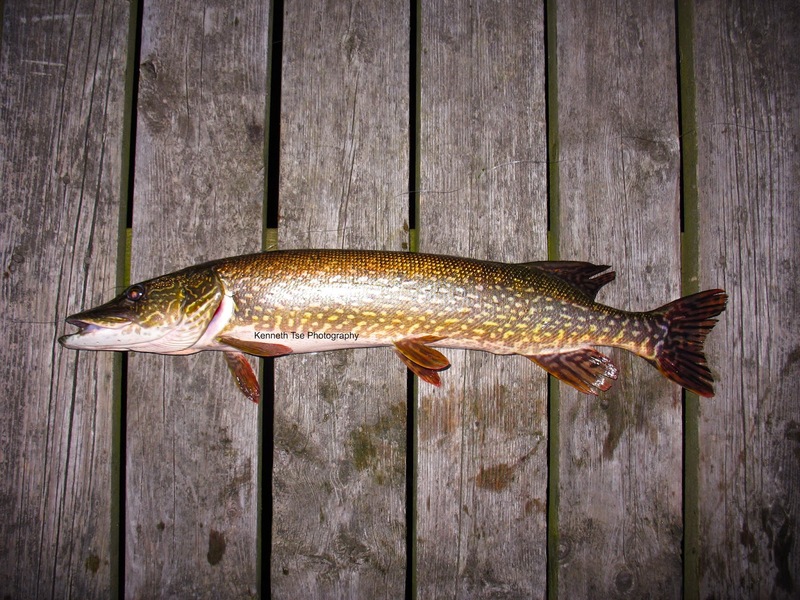 Once it got brighter, I switched back to ole trusty and had a missed hit and a follow from two pike. That was it for the morning though.